STS researchers have a long tradition for caring for participation – advocating public participation in science and innovation (e.g. Irwin 2006), exploring participation as it unfolds in practice (e.g. Callon & Raberharisoa 2008), and in some instances actively taking part in instigating participation (e.g. van de Bovenkamp & Zuiderent-Jerak 2013). The EASST Conference 2014 was no exception with several tracks and presentations addressing issues of participation in different arenas. The wide span of issues that presentations addressed illustrated the richness of how and in what we as STS researchers participate when we engage with participation as a research object. Yet, it also highlighted a need for further discussion of STS’s engagement with participation. How do we define participation? What are the effects of different conceptualizations and, not least, valuations of participation – empirically, analytically and, ultimately, politically? With the following tour through EASST talks about participation, I wish to underline the relevance of attending to these questions and, in general, of continuing to ‘care for participation’ in STS. ‘Battles to fight’ is an interesting choice of words as it echoes the traditionally strong political commitment to participation in STS. Moreover, Thygesen and Moser’s call points to the multiple and at times conflicting values that participation is ascribed in different empirical contexts as well as in academic discourses. One ‘battle’ for STS could therefore be to critically attend to these different normative framings of participation and what they produce empirically and analytically. The majority of the presentations in the track did not explicitly deal with ‘participation’, but with often-related terms such as ‘empowerment’ (e.g. Lisa Lindén), ‘self-management’ (e.g. Nete Schwennesen) and ‘Patient 2.0’ (e.g. Alberto Zanutto et al; Søsser Brodersen & Hanne Lindegaard). The track itself thereby came to illustrate the elasticity of the concept ‘participation’ – or, put more critically, how it often comes to serve as somewhat of a ‘ragbag’. Some presentations did, however, address participation head-on – primarily by unpacking different empirical framings of participation and their practical implications and, to a lesser extend, by attending to the analytical effects of different (STS) conceptualizations of participation. Mare Knibbe (with Klasien Horstman) shared their insights from a Dutch mental health promotion project that applied mixed media to reach community members of low socioeconomic status. Embedded in a local policy discourse of “together we can do it ourselves”, the project could be seen as an example of what is framed as a move “from welfare society to participatory society” in the Netherlands and elsewhere. Knibbe showed how the local participatory discourse materialized in two very different kinds of participation for community members in the specific project: from being part of the making of an intervention (six short films about challenges in everyday life) to more indirectly being ‘informed and activated to take part’ in solving these by watching the films. In the latter case, what community members were to participate in – that is, the ‘relational aspect’ of participation – was rather unclear. Maybe ‘empowerment’ would be a more suitable term than participation for the kind of agency that was sought instigated as a result of the project. Also referring to a Dutch context, Susan van Hees (with Klasien Horstman, Maria Jansen, and Dirk Ruwaard) showed how ‘empowerment’ is a cornerstone in creating so-called participatory societies and, as such, perhaps something that precedes participation. Yet, we quickly get lost in a ‘the chicken and the egg’-discussion here since empowered citizens can be perceived as both a prerequisite and a result of a ‘participatory society’. Van Hees captured this empirical and conceptual entanglement of empowerment and participation by speaking of “the soft technologies” of the participatory society that serve to “activate to participation”, with participation translating into a kind of citizenship that entails responsibilities rather than entitlements. Van Hees specifically showed how professionals in elderly care use ‘soft technologies’ such as kitchen-table conversations and shared registration systems to facilitate a specific version of ‘empowered citizenship’. In this process, older citizens ‘participate’ in a negotiation of how to handle everyday life – a negotiation that, put bluntly, aim to convince them to take on certain responsibilities and care for themselves, that is, to be active participants in society by being active in their own lives in specific ways. ‘Convincing-through-dialogue’ as a ‘soft technology’ of the participatory society was also the key figure of Laura Navne’s presentation (with Mette Nordahl Svendsen). Navne focused on how parents and health professionals at a Danish neonatal care unit reach consensus about when and why to continue or withdraw life-sustaining treatment from infants. She showed how decision-making processes regarding specific infants were guided by an overall strong ”ethos of participation and consensus” typical for the Danish welfare society. In practice, decision-making involved a process of on- and off-the-scene negotiation of different concerns (the infant, the parents, the clinic, and other members/the collective of society) in which the parents’ participation most of all seemed to be treated as a process of being ’convinced to reach consensus’. On this background, Navne directed attention to the way practices of participation tend to privilege ’agreeing participants’ and leave little room for objection. That is, non-adherence to professionals’ recommendations may be perceived as ’bad participation’ – or even as ‘non-participation’. With presentations such as the three I mention above, the track on technologies of care and participation interestingly opened up practices and discourses of participation in different care and welfare arenas, illustrating how participation as a political trope is highly amorphous and often problematic. That is, it carries with it a number of different and often-implicit notions of good citizenship and, in practice (when embedded in welfare policies, technologies, and practices) constitutes a kind of ‘soft power’. In our own presentation in the track, Henriette Langstrup and I proposed conceptualizing participatory technologies (for example e-health) as posing ‘soft structures’ to their users. Drawing on Michel de Certeau (1984), we further proposed to understand use practices – or practices of participation more broadly – as participatory ‘tactics’, that is, users’ creative ‘making-do’ with arrangements that are given to them (pp.29-30). With this conceptualization, we aimed to bring out the political nature of devices aimed at instigating participation and, importantly, the political nature of the use of these devices, also when they are designed to support seemingly ‘private’ or ‘individual’ projects. Our attention to participation as a political ‘norm and form’ which is increasingly linked to technological innovation was inspired by Noortje Marres (2012) and her work on material participation in environmental matters. And we were not the only ones to find inspiration in Marres’ call for STS to take a renewed look at the politics of different participatory technologies, which STS itself has helped give shape to and continues to promote, especially in the case of public participation in science and innovation. The track “Non-concerns about science and technology and within STS” hosted several presentations on pubic participation with some of these also offering interesting analytics. In an analysis of citizen panel deliberations about older people and ICT in Spain, Juan Carlos Aceros (with Miquel Domenech) zoomed in on how opinions are ‘refined’ through a process of making ‘illegitimate’, private matters publically relevant. Whenever panel participants would present an argument in a ‘too personal’ format, panel facilitators (and other participants) would intervene and either quickly rule out these arguments as relevant or help translate them into a relevant format. Speaking on different “engagement formats”, Aceros drew on Thévenot (2007) and further conceptualized the process of shaping formats as a matter of making so-called personal opinions and stories ‘scalable’ and ‘exportable’. This process may be perceived as oppressive and even humiliating; yet, it also produces representation and creates public opinion. The questions is, however and as Aceros pointed out, if we can create and promote participatory devices that are open to personal matters and formats. Aceros thereby also seemed to suggest a combined analytical and practical/interventionist approach to participation in STS that seeks to reconfigure the politics of participation and participatory devices in a way that allows for and acknowledges multiple forms of engagement. 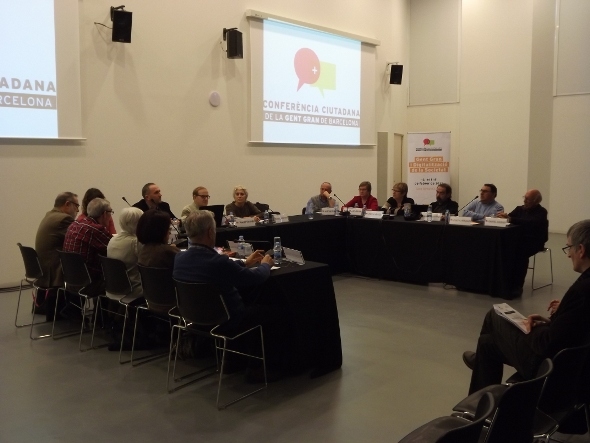 A consensus conference in Catalonia. Photo courtesy of the Barcelona Science and Technology Studies Group (STS-b). Another, and highly entertaining, conceptual contribution that highlighted the politics of technologies of public participation came from Guillem Palà and Gonzalo Correa. Drawing on STS work on ‘absences’ (e.g. Meyer 2012), Palà and Correa set out to conceptually open up the conspicuous paradox of deliberative processes; that is, the simultaneous affirmation and denial of the figure of representation. In deliberative processes, participatory devices, such as citizen panels, serve to ‘capture’ those who are absent and make them somehow present. Although seemingly absent, ‘non-participants’ do important work in securing the democratic legitimacy of deliberative processes. Palà and Correa went on to propose an analytics to grasp the dynamic relation between presence and absence and the devices that are used to handle this relation. Adopting the terminology of the movie “Ghostbusters”, we might think of participatory devices as ‘traps’ and ‘containment units’ that serve to capture non-participants who we can also term ‘ghosts’. 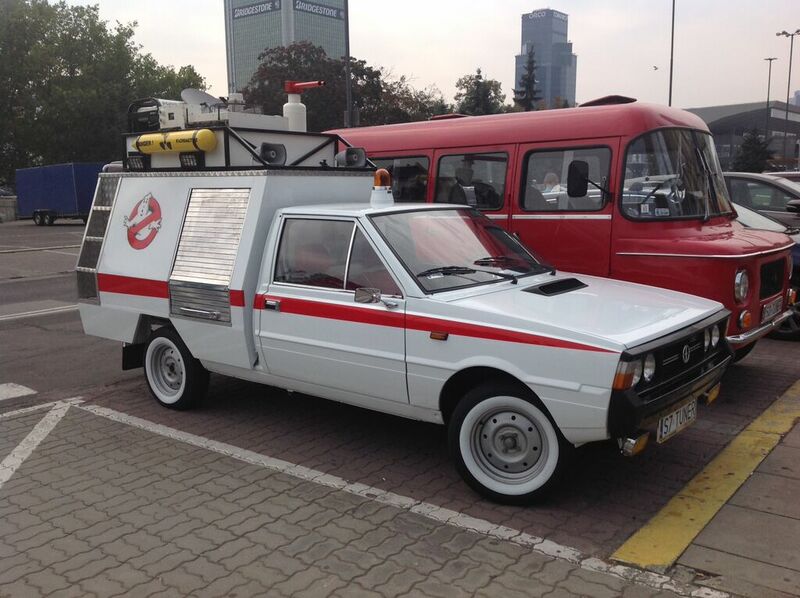 Facilitators of participation may then be understood as ‘ghostbusters’. All these actors are part of the infrastructure of participation – what Palà and Correa also called the ‘plasma’ of participation; that is, the formless matter that shape participation. In this wobbly infrastructure, so-called ‘non-participation’ plays an equally important role as direct or visible participation and is thus not something we can place ‘outside’ the realm of or in opposition to participation, democracy, politics etc. Judging from the range of presentations on participation at EASST 2014, STS scholars certainly continues to care for and find ‘battles to fight’ in relation to participation, first of all empirically, but also conceptually as STS continues to search for analytics that can help qualify and nuance the all-inclusive term and political trope that participation is so often used as. I believe that one important task traverses empirical and conceptual contributions: to pay attention to the normative and political projects we as researchers tap into and contribute to when we study, conceptualize and, at times, facilitate participation. We should strive to: clarify what we mean by participation and how we understand it in relation to other terms such as empowerment; make visible the values we ascribe to participation; and, at the same time, be open to recognize and revisit practices and devices that may at first glance fall outside our own or others’ assumptions about ‘real’ participation. Some of the analytics referred to above seem to have the potential for helping us do so. Importantly, all empirical cases and analytics that I have here referred to deal with what we could call ‘invited participation’ (Wehling 2012). Other presentations also dealt with ‘uninvited participation’ – that is, more activist and bottom-up forms of participation. It would be interesting to inquire into how the presented analytics would work when studying these forms of participation. Callon, M. & V. Rabehariosa (2008) ‘The Growing Engagement of Emergent Concerned Groups in Political and Economic Life’, Science, Technology & Human Values 33(2): 230–261. de Certeau, M. (1984) ‘The Practice of Everyday Life’ (Berkeley: University of California Press). Irwin, A. (2006) ‘The Politics of Talk Coming to Terms with the ‘New’ Scientific Governance’, Social studies of science 36(2): 299–320. Marres, N. (2012) ‘Material Participation: Technology, the Environment and Everyday Publics’ (Basingstoke: Palgrave Macmillan). Meyer, M. (2012) ‘Placing and tracing absence: A material culture of the immaterial’, Journal of Material Culture 17(1): 103-110. Thévenot, L. (2007) ‘The plurality of cognitive formats and engagements moving between the familiar and the public’, European journal of social theory 10(3): 409-423.
van de Bovenkamp, H.M. & T. Zuiderent-Jerak (2013) ‘An Empirical Study of patient Participation in Guideline Development: Exploring the Potential for Articulating Patient Knowledge in Evidence-Based Epistemic Settings’, Health Expectations (in press). Wehling, P. (2012) ‘From Invited to Uninvited Participation (and Back? ): Rethinking Civil Society Engagement in Technology Assessment and Development’, Poiesis & Praxis : International Journal of Ethics of Science and Technology Assessment 9(1–2): 43–60. Karen Dam Nielsen is Post doc at the Department of Computer Science, University of Copenhagen, and at Academic Medical Center, University of Amsterdam. She has recently concluded her dissertation research on e-health and patient participation at the Centre for Medical Science & Technology Studies, University of Copenhagen, and continues her research on this topic in the intersection between STS and design research. Previous ArticleInterdisciplinarity and Comparison: A Workshop on Cultures of Video Games ConcernsNext ArticleQuantifying the Body and Health: Adding to the Buzz? Quantifying the Body and Health: Adding to the Buzz?